Abu Dhabi Ports truly believes that the heart of true sustainable development embraces economic, environment and social aspects in a cohesive approach. We chart our business roadmap by entrenching sustainable initiatives, policies and plans to protect and preserve the ecosystem and communities around our projects. 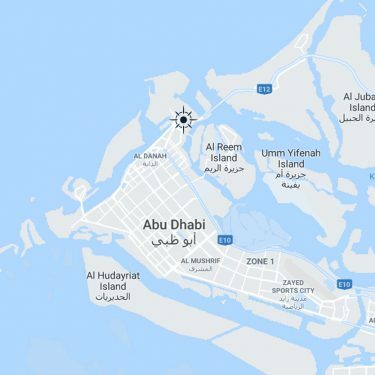 The story of Abu Dhabi Ports took an unexpected turn even before its flagship, Khalifa Port – one the world’s most advanced deep-sea ports and the region’s first semi-automated port – got off the drawing boards. Khalifa Port and Khalifa Industrial Zone (KIZAD), together, form a sterling success story. The projects were planned, designed and constructed to keep environmental impact to an absolute minimum and contribute to Abu Dhabi economic growth. Of the four shortlisted locations, Abu Dhabi Ports chose the Al Taweelah area as the ideal choice to site the new project. Located mid-way between Abu Dhabi and Dubai, the location offered many benefits such as multi-modal connectivity to airports, the future Etihad Rail network, highways and other essential infrastructure. The selected location posed a serious challenge. Ras Ghanada, the Gulf and UAE’s largest coral reef and sea meadows, was adjacent to the proposed Khalifa Port and Khalifa Industrial Zone (KIZAD). Spreading over 25 square kilometres of seafloor, the reef teems with more than 20 species of hardy corals and fish. To preserve and protect UAE’s national marine treasure, Abu Dhabi Ports hired renowned international consultants to come up with a sustainable design proposal that went beyond all norms. At a cost of billions of dirhams, the port was shifted 4-kilometres offshore and was developed as a man-made island. It was connected to the mainland by two causeways to preserve the natural flow of sea currents along the coastline. Together with an 8km environmental breakwater, which cuts down on sea-swell, contamination and unnecessary temperature changes from port use. That decision came with a high cost in the short- term. But it made a huge impact on the country’s coastline and marine life in the long run. Abu Dhabi Ports earned a number of awards for the project and its commitment to the environment and sustainability. Most notably for the breakwater initiative. Khalifa Port started operations in 2012, and, we are proud to report that the corals and creatures of Ras Ghanada are safeguarded. To preserve the natural habitat, Abu Dhabi Ports implements a regular annual coral monitoring program – prominent environmental experts undertake three marine inspections to ensure that the port expansions and industrial operations do not cause damage to the coral reef. Additionally, we ensure that our business roadmap remains committed to sustainable development through innovative environmental solutions that help customers save time and money – e.g. constructing the hot metal road, the modular path and the seawater cooling and desalination system in the Khalifa Industrial Zone Abu Dhabi (KIZAD). It is a given that we take a sustainable approach to doing business. We pay long-term attention as to how the environment affects the evolvement of the communities that live and work around our ports. Across our projects, we implement Estidama Building Standards, an initiative developed by Abu Dhabi Urban Planning Council, to promote responsible design and sustainable developments in the Emirate. We also commit to improving air and water quality, conserve energy and resources when we modernize our facilities. Additionally, Abu Dhabi Ports has established a comprehensive Waste Management Program to handle all the waste from shipping lines calling at our ports, our tenants and all other port users. In line with the long-term vision of the Abu Dhabi Government to achieve 100% recycling of generated waste, and reduce the environmental impact by minimizing landfills, we set annual waste management objectives and work closely with our business partners to achieve those targets. Furthermore, to promote a competitive spirit among our employees and clients in adopting the highest health, safety and environment (HSE) practices across our various facilities, we launched “NEESHAN” Award. We also introduced “SENYAR” an integrated HSE Management System application, as part of our strategic plan aimed at sustaining a safe work environment. We at Abu Dhabi Ports believe that sustainability is not a specific task but rather a way of thinking. We seek idea generators who will bring about creative change and growth within the maritime and trade sectors in the region and globally. In December 2013, we launched IBTIKAR (Arabic for “innovation”) – an in-house suggestions scheme program, which underpins our constant quest for innovative sustainable solutions to business and process, to encourage active participation from everyone, be it our employees, customers or stakeholders. As a result of digitizing processes implemented by Maqta Gateway, an Abu Dhabi Ports subsidiary, we introduced the Port Community System (PCS), which is a single window system for different maritime and trade stakeholders and customers to interact in a streamlined manner. The new paperless environment resulted in increased business process efficiencies and a cleaner environment; with a reduction in paperwork by more than 6.8 thousand tons papers in 2017 alone. We also established the first Port Innovation Lab in the Middle East to study emerging technologies that can be tested and applied in the maritime and trade sectors. Based on our three strategic pillars, Abu Dhabi Ports undertakes a sustainable approach across new and future business to ensure continued growth and fast-paced community development. We recognize that the maritime and trade sector is vital to Abu Dhabi’s Vision 2030 to diversify the Emirate’s strategy towards a non-oil economy. Together, it is estimated that Abu Dhabi Ports and KIZAD contributed nearly 3.6% or AED 19.6 billion to Abu Dhabi’s non-oil GDP in 2017. Overall, we also supported over 91,000 jobs across the UAE and over AED 24 billion in value-added contribution to national GDP. By applying best practices, we increased revenue through new strategic business alliances with prominent regional and global players such as COSCO Shipping, Autoterminal, MSC, and EGA among many others. Download our Fact Sheet on our latest breakthrough and innovative business deals that promote a sustainable economic growth. In line with our continuous efforts to bolster the sustainable growth of Abu Dhabi, as a global hub for both commerce and tourism, we spearheaded the development of the cruise tourism industry, by offering cruise ship passengers a new and unique destination with unique tourism experiences, through our Cruise terminal located in Zayed Port. In addition, we launched Sir Bani Yas Cruise Beach, which represents the Gulf region’s only dedicated ‘desert island’ cruise stopover. Off the coast of Abu Dhabi, the 87-square-kilometre island is home to one of the UAE’s largest animal reserves open to public. The facility is expected to attract more regional cruise operators and will play a vital role in further increasing Abu Dhabi’s cruise passenger traffic. We maintain a holistic and sustainable vision in all we do. So that our business offerings of today, serve the world of tomorrow.